I am proud to announce that I have received recognition from a fellow blogger! 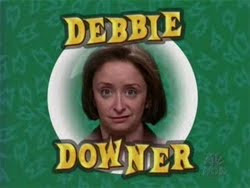 That's right -- Jenners, currently serving as the Vice Dork of the L&TM5K, has given me the special "Debbie Downer" award on her "Find Your Next Book Here." Because I spoke some Truth. Needless to say, I am deeply honored and will do my best to fulfill my Debbie Downer duties to the best of my abilities. I can't believe this is filed under "like you care." That does little for my self-esteem, Debbie! Well, I'm a downer. But "Like You Care" is just the label for things that are about me personally, as opposed to real content that people are likely to be interested in. You know, like boring postcards or random CDs I bought on the cheap.